The first Blockbuster Video store opened in Dallas, Texas. Remember those? 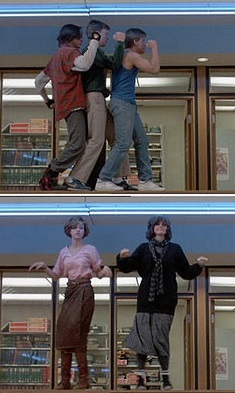 The Breakfast Club debuted in theaters. Without an iPhone for distraction, 10-year-old me spent hours trying to master the cool dance moves demonstrated right. Commodore’s Amiga 1000 is released. It sold for $1,295 dollars (without monitor). Only 13% of households in the United Kingdom owned a personal computer. Aldus announced its PageMaker program for use on Macintosh computers, launching an interest in desktop publishing. Oh, how far we’ve come! The 80s were a glorious time for renting videos and dancing in detention, with just a hint of the personal computing and desktop publishing to come. Despite the technological advances that have occurred over the past quarter century, however, a simple truth about how people work remains the same: we enjoy doing business with people we know. It just feels better that way. This simple truth is one of the main reasons over 140,000 book professionals traveled to Germany earlier this month to participate in the 2014 Frankfurt Book Fair, held October 8-12, 2014. As it currently operates, the Frankfurt Book Fair is the largest global marketplace for books, media, rights, and licenses worldwide. In contrast to BookExpo America, where walk-up traffic can yield the majority of business in a booth, the Frankfurt Book Fair is a show driven by pre-arranged meetings. People walking by a booth in Frankfurt would be hard pressed to stop unless they had an appointment. This means many of the booths are “stripped down” without the bells and whistles of the showcase booths at BookExpo. A strong booth really only needs four things: (1) great books, (2) smart staff, (3) identifiable branding, and (4) plenty of wine for the 5 o’clock cocktail hour. It is Europe, after all! Ensuring that IBPA’s cooperative booth included all of the above was our Chief Operations Officer, Terry Nathan. Prior to the Fair, Terry arranged meetings with over 55 international rights buyers to whom we could present the one hundred seventy-nine (179) member titles represented in our cooperative booth (up from 133 titles represented in 2013). In the photo right I’m standing with Elva Wang of China’s Publishing House of Electronics Industry after our discussion of Chinese translation opportunities. Each meeting with a foreign rights buyer lasts 15-30 minutes. The first thing to be done is to get a sense of a particular area of interest. Interest areas are generally very narrow. Sometimes we have many titles for them to consider; sometimes just a few. In rare cases, we won’t have anything at all. But, like everything in this business, it comes down to the personal relationship. Over the past 29 years, IBPA has become a trusted partner. Even if we don’t have something of interest one year, many of our contacts book again for the following year. IBPA’s consistency and professionalism matter. A complete catalog of titles represented in IBPA’s cooperative booth is available online and will be sent in a follow-up email to all IBPA’s foreign rights contacts. To take a look at each book displayed, check out the photo album on Facebook. If you displayed your titles in IBPA’s cooperative booth you can expect to hear about any interest received by the end of this month. Selling your rights to an international buyer can be complex, but extremely rewarding. For those interested in sharpening their skills in this area, we’ve arranged a special educational webinar with Cat Russo, President and Founder of RussoRights, LLC. Cat’s session, described below, will be held December 3, 2014 at 10AM Pacific/1PM Eastern. The Frankfurt Book Fair… So Now What Happens? The Frankfurt Book Fair is the single largest international rights sales event in book publishing. Each year, many independent publishers display their titles and catalogs at the show in IBPA’s cooperative booth. Those who do look forward to receiving the collected leads, but then it becomes up to them, the publishers, to take the next step. So, how to proceed? In this special IBPA webinar, rights specialist Cat Russo (photo left) will provide tips and advice on how to follow up from the Frankfurt Book Fair in order to move translation and other subsidiary rights agreements forward. She will also spend time answering your specific questions during a moderated Q&A. Cat Russo is president of RussoRights, LLC a small firm representing business and education publishers. In addition to representing our members’ titles in the cooperative booth, we were equally privileged to have been joined on the show floor by those members who chose to purchase a private or shared booth through IBPA. Special thanks to Ethan Atkin at Cranbury International, Sabine Weeke at Findhorn Press, Jennifer Lewis, Sara Pfeiffer, and Jenna Roby at Gryphon House, Jean Trumbull at Impact Publishers, Inc., Brooke O’Donnell, Joe Matthews, and Mark Voigt at Independent Publishers Group, Stephen Buda at J. Ross Publishing, Maria Kjoller at Lerner Publishing Group, Bill Krause at Llewellyn Worldwide, Ltd., Bruce Lansky at Meadowbrook Press, Dorothy Smyk at New Harbinger Publications, Jim Schmelzer at Publishers’ Services International, Donald Lessne at Rights & Distribution, Inc., John Atkin at Silvermine International Books, and Chris Bauerle, Sara Hartman-Seeskin, Stephanie Bowen, and Steve Geck at Sourcebooks. By signing up to host their own booth with IBPA, these members received free freight to the Fair in addition to booth support on site. We look forward to hosting them again in 2015! The team from Gryphon House await their first meeting during the 2014 Frankfurt Book Fair. From left to right: Jennifer Lewis, General Manager, Sara Pfeiffer, Rights Assistant, and Jenna Roby, Marketing and Research Specialist. According to Frankfurt officials, 140,291 trade visitors attended the 2014 fair, down from the 142,921 professional visitors attending the 2013 fair, a decline of less than 2%. But that wasn’t all. Frankfurt officials also reported total attendance clocking in at an incredible 269,534 visitors. So, who were the over 125,000 “non-trade” visitors? Most of them were Cosplayers. Cosplay is a contraction of the words ‘costume’ and ‘play’. Cosplayers dress up as their favorite characters from animated films, comics, books, and manga. IBPA member Stephen Buda from J. Ross Publishing took a walk around the Frankfurt halls on Saturday, October 11 to meet some of the players and take pictures. He didn’t take notes so we have no idea who these folks represent. We wish we did! If you can identify them, please let us know in the comments. We have no idea who these people are supposed to represent. They’re definitely cool, but mostly we’re loving the random guy in the background eating a sandwich. These people are a mystery to us, as well. This means the English-language exhibitors, including IBPA and all our friends, will move from Hall 8 to Hall 6. To understand the implications of this move is to understand the vastness of the Frankfurt fairground itself. As occupants of Hall 8, the English-language publishers have been a bit removed. The full Frankfurt fairground is 578,000 square meters inclusive of 10 exhibition halls. It can take upwards of 20-30 minutes to walk from Hall 8 to some of the other locations on the fairgrounds. Moving to Hall 6 puts us much closer the European halls, particularly the German-language publishers. This could be beneficial for business on Wednesday through Friday, but perhaps more disruptive than usual on Saturday and Sunday since we’ll be so much closer to the where the German cosplayers come to play. In any event, we wouldn’t miss it. And we hope you’ll join us, as well! For those interested, more information about IBPA’s Trade Show Exhibit Program is available here.